Robotic hysterectomy using the da Vinci robot is the most 'state-of-the-art' technique of having a hysterectomy today. A hysterectomy using the da Vinci robot is an incredibly precise way of performing the operation. It is a means of performing a laparoscopic hysterectomy (keyhole hysterectomy) with the gynaecologist precisely controlling the robotic instruments via a 'console'. In the UK, one in 5 women are likely to have a hysterectomy by the age of 60. Hysterectomies are either performed open, vaginally (if there is a degree of prolapse), laparoscopically and now there is the option of patients having a robotic hysterectomy. It is likely that over the next few years more and more hysterectomies will be performed robotically. However, it will require more hospitals to invest in the technology, and will require more gynaecological surgeons to be trained in robotic gynaecolgy. 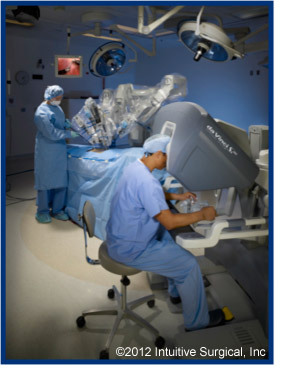 In the United States, gynaecologists are now the biggest users of the da Vinci robot. Robotic hysterectomy is the commonest operation performed in gynaecology using the da Vinci robot. Using a da Vinci robot gives the surgeon the advantage of a three-dimensional (3-D), high-definition view, the control of the camera and three robotic 'arms'. The instruments are all articulated with a robotic wrist, which precisely mimics the surgeon's movements. The surgeon also suffers less fatigue compared to laparoscopic surgery because they are comfortably seated at the console. A robotic hysterectomy gives the patient all the advantages of laparoscopic (minimal access surgery): small, cosmetic incisions, less post-operative pain, reduced risk of infection, a reduced hospital stay and a quicker return to normal activities. Patients usually go home the day after a robotic hysterectomy (in Mr Elkington's practice) and they are often ready to go back to work much sooner than with conventional open surgery. Robotic hysterectomy has a number of clinical indications: heavy, painful or prolonged periods, fibroids, endometriosis, adenomyosis that have not improved with more conservative treatments. Robotic hysterectomy is probably the commonest operation performed in gynaecology using the da Vinci robot.